Access Now all Japan Cars Auctions with over 100,000 vehicles updated weekly. Search your dream cars with our smart user friendly Japan Auto Auctions interface. Our higly professional & trained staff is there at every step to assist you to manage your cost and buy vehicles from Auction at best price. Access Over 100,000 Cars at Japan Auto Auction! Check Live Auction in One Click !! 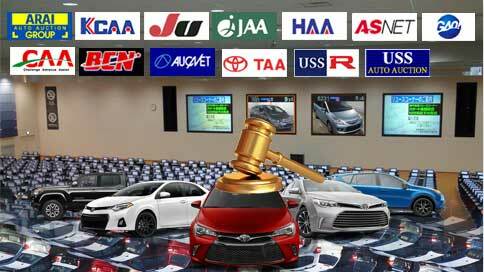 Bidding Fee is not charged for vehicles bought from Japan Auto Auctions unlike other used car exporters. You can save more while buying used vehicles from Traffic Co., Ltd. and gain more profit on its re-sale. Auction Inspection Sheets are mostly in Japanese language and in specific codes. To get better idea about the vehicle condition inspection sheet is the best source. We translate the complete inspection report absolutely free of cost and provide you the exact vehicle condition as depicted from the auction sheet. Market Price or average price of a particular vehicle sold in auction is very important to decide your budget before you start buying from auctions. If you know the market price of the vehicle you are looking to buy it will be much easier for your to bid, negotiate the prices if you are buying from other sources. 8% tax is applicable of the Car cost that you are buying from Japan. We are not charging 8% tax amount on the vehicles bought from us that saves your cost to import vehicle and gain more profit. Recycle Deposit is included in the vehicles cost that are exported from Japan. We are not charging the Recycle Deposit and hence the vehicles are available at low cost as compared to the other exporters. We are also not charging the Radiation inspection fee which is a mandatory in some countries for the vehicles exported from Japan. Your cost for this inspection is saved when you buy from Traffic Co., Ltd. and vehicle is much cheaper as compared to other dealers. Traffic Co., Ltd. handles all the paper formalities related to the custom clearance of the vehicle in your country. All necessary vehicle documentation that are used to import vehicle in your country are provided free of cost, to make sure the import process in hassle free. Why Buy Cars from Online Auction? Best way to source the vehicles at low price, as vehicles are sold at competitive price in Auctions. More than 100,000 vehciles are available from over 90 auctions in Japan to choose your required vehcile. Accurate Inspection Sheet of Vehicle from Auction to get correct condition of the vehicle. We make sure to inform you quality of cars. Market Price Statistics to find out average price of vehicles before you bid. Save money at maximum!! High Quality Vehicles available at average prices.